Deep in the Bolivian jungle, an elite US Special Forces unit is preparing an airstrike on a local crime lord’s heavily armed compound. The group, under the command of square-jawed Franklin Clay (Jeffrey Dean Morgan, Grey’s Anatomy), is horrified to see a number of children inside the compound. They frantically try to cancel the airstrike, only to be informed that the mission is under the control of someone named ‘Max’, and that the attack will be going ahead as planned, thank you very much. Long story short: the group rescue the children, put them on a helicopter, Max blows up said helicopter, everyone assumes Clay and his team are dead. They meander around Bolivia for a few months before being smuggled back into the states by the leggily mysterious Aisha al-Fadhil (Avatar’s Zoe Saldana). Her one condition? That Clay’s men find the elusive, nefarious Max (Jason Patric) and dispose of him for good. 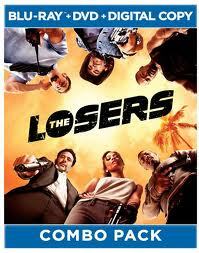 A big, mindless yet fast-paced affair, The Losers is so unrelentingly action-packed that it’s impossible not be drawn in by its flash and bombast. Saldana is as smouldering as ever, and a supporting cast which includes Chris Evans (Fantastic Four) do their best to muster some semblance of nuance from an admittedly wafer-thin premise. Patric doesn’t really have the chops to pull of his role as villain. The dastardly Max is so unrelentingly evil he makes Adolf Hitler look like Mary Poppins – at one point he shoots a female assistant in the head because she fails to handle an umbrella correctly – but Patric seems unsure whether to play it straight or go for over-the-top comic book supervillainy, and in the end winds up achieving nothing much of anything. But by this point it doesn’t really matter. The focus is on the eponymous outfit and their efforts to track down and assassinate Max, not on his silly high-tech WMD’s or his penchant for talking down to underlings. Calling these characters cardboard is an insult to a useful packaging material, but there are more than enough explosions and fight sequences to compensate, and the end result is a fun, flamboyantly airheaded popcorn flick that gives plenty of bang for its buck. There are three behind the scenes featurettes: Zoe and The Losers, a six-minute ode to the stunning Zoe Saldana; Band of Buddies: Ops Training, a three-part, fifteen-minute look at the set designs, cinematography and extensive physical training undertaken by the cast members; and The Losers: Action-Style Storytelling, ten-minute’s worth of interviews with Andy Diggle and ‘Jock,’ the creators of the Losers comic, and a comparison of the graphic novel and the live-action rendition. Also included are a short, fairly superfluous bonus scene and a fourteen-minute ‘early, breathtaking look’ at the DC Universe animated film Batman: Under the Red Hood. There’s also Warner Bros BD Live capability, for those whose Blu-ray players are so enabled. The lack of a commentary track is a glaring omission, but much of the bonus content is exclusive to Blu-ray, presented in high-definition and proves a satisfying addendum to this silly, guiltily enjoyable potboiler.